It’s no secret that there is a serious waste problem within the electronics industry. That’s what inspired the latest project by the National Phyysical Laboratory, In2Tec Ltd, and Gwent Electronic Materials Ltd. 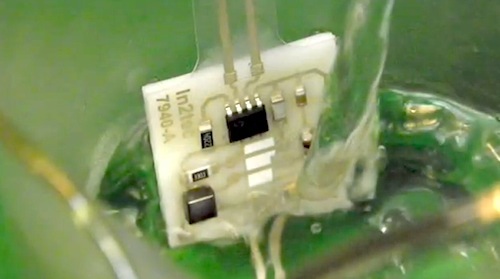 The result is a printed circuit board with components that are easily separated when immersed in hot water. This allows as much as 90% of the original structure to be reused, compared to the 2% of traditional PCB material that can be reused. This ReUSE project (Reuseable, Unzippable, Sustainable Electronics) is funded by the Technology Strategy Board of the UK and aims to increase the recyclability of electronic assemblies, to cut down on the 100 million electronic units discarded every year in the UK alone. With as much as 85% of waste going into landfills, this leads to around 1 million tons of e-waste just in the UK every year. This technology is available for rigid, flexible, and 3D structures, allowing the industry to focus on new designs that will benefit from this and help reduce material waste. Do you think the electronics industry will start to use inventions such as this to curb the rapidly growing e-waste problem? Next post: US Can Become World’s Biggest Oil Producer, But At What Price?